The 1984 United States presidential election in Virginia took place on November 6, 1984. All fifty states and the District of Columbia, were part of the 1984 United States presidential election. Virginia voters chose twelve electors to the Electoral College, which selected the president and vice president of the United States. Virginia was won by incumbent United States President Ronald Reagan of California, who was running against former Vice President Walter Mondale of Minnesota. Reagan ran for a second time with incumbent Vice President and former C.I.A. Director George H. W. Bush of Texas, and Mondale ran with Representative Geraldine Ferraro of New York, the first major female candidate for the vice presidency. The presidential election of 1984 was a very partisan election for Virginia, with just under 99 percent of the electorate voting only either Democratic or Republican, and only three candidates appearing on the ballot. The majority of counties in Virginia voted for the Republican candidate in a particularly strong turn out, in what was at the time a typically conservative-leaning state. 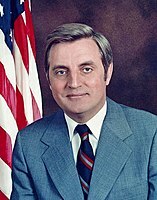 Mondale did gain majorities in largely African-American counties in the east, highly unionized coal counties in southwest Virginia, and the independent cities of Alexandria, Norfolk, and Richmond. Virginia weighed in for this election as five percent more Republican than the national average. As of the 2016 presidential election[update], this is the last election in which the independent cities of Franklin, Roanoke, and Falls Church voted for the Republican candidate. A very significant political move during this election: the Democratic Party nominated Representative Geraldine Ferraro to run with Mondale as Vice-President. Ferraro is the first female candidate to receive such a nomination from the party in United States history. She said in an interview at the 1984 Democratic National Convention that this action "opened a door which will never be closed again," speaking to the role of women in politics. Away from the campaign trail, Reagan (center, far left frame) attends the interment ceremony for the Vietnam Era serviceman, at the Tomb of the Unknowns, Arlington National Cemetery, Virginia. May 28, 1984. By 1984, Reagan was very popular with voters across the nation as the President who saw them out of the economic stagflation of the early and middle 1970s, and into a period of (relative) economic stability. Reagan won the election in Virginia with a resounding 25 point sweep-out landslide. While Virginia typically voted conservative at the time, the election results in Virginia are also reflective of a nationwide reconsolidation of base for the Republican Party which took place through the 1980s; called by Reagan the "second American Revolution." This was most evident during the 1984 presidential election. Reagan also enjoyed high levels of bipartisan support during the 1984 presidential election, both in Virginia, and across the nation at large. Many registered Democrats who voted for Reagan (Reagan Democrats) stated that they had chosen to do so because they associated him with the economic recovery, because of his strong stance on national security issues with Russia, and because they considered the Democrats as "supporting American poor and minorities at the expense of the middle class." These public opinion factors contributed to Reagan's 1984 landslide victory, in Virginia and elsewhere. All 10 congressional districts, including 4 that elected democrat congressmen voted for Reagan. 65% 35% Thomas J. Bliley Jr.